Supports OVERSCAN and UNDERSCAN display modes. Supported Input VGA Signal Resolution: 640 x 480/800 x 600/1024 x 640/1024 x 768/1280 x 720/1280 x 768/1280 x 800/1280 x 1024/1280 x 854/1280 x 960/1360 x 768/1365 x 768/1366 x 768/1440 x 900/1600 x 1200/1920 x 1080/1920 x 1200/ 1152 x 864/1176 x 664/1600 x 900/1600 x 1000/1600 x 1024/1680 x 1050/1768 x 992/1792 x 1344/1800 x 1440/1856 x 1392/2048 x 1152/2048 x 1280/2048 x 1536/2560 x 1600. VGA input (VGA IN): Connect the VGA cable from the computer graphics card to VT. VGA output (VGA OUT): Connect VT to the monitor. This is a portable computer-to-TV converter for TV standards around the world. 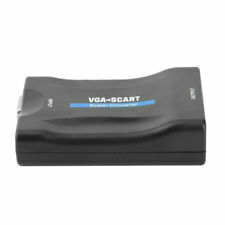 Features: This product is VGA to SCART adapter, easily connect TV to your computer, projector, etc. Support NTSC, PAL, SECAM SCART interface TV system. Support full-screen (OVERSCAN) and non-full-screen (UNDERSCAN) two display modes. Mini size and lightweight, convenient to carry and use. Easy to use, plug and play, no need to install drivers. Specifications: Material: Plastic Color: Black Interface: VGA input, SCART Output, 3.5mm Audio Input Resolution: 640x480/800x600/1024x640/1024x768/1280x720/1280x768/1280x800/ 1280x1024/1280x854/1280x960 Power Supply: DC 5V Package Includes:. Features:It's designed to convert VGA to SCART.It allows you to enjoy movies and games from VGA-enabled laptop on the older SCART TV or projector that doesn't support VGA input.VGA input, Scart output both video and audio at the same time. No need to install drivers.Portable and flexible.Description:Plug and play.High quality scaling technology for input resolutions.Enter the VGA signal support resolution:640x480/800x600/1024x640/1024x768/1280x720/1280x768/1280x800/ 1280x1024/1280x854/1280x960/1360x768/1365x768/1366x768/ 1440x900/1600x1200/1920x1080/1920x1200/1920x1440/1152x864/ 1176x664/1600x900/1600x1000/1600x1024/1680x1050/1768x992/ 1792x1344/1800x1440/ 1856x1392/2048x1152/2048x1280/2048x1536/ 2560x1600Specifications:Color: blackSize: 90*58*. Features: Supports NTSC, PAL and SECAM three standard TV system. Support full-screen (OVERSCAN) and non-full-screen (UNDERSCAN) two display modes. Mini size and lightweight, convenient to carry and use. Supports composite video, S-Video, RGB, (optionally) RGB output (without cable). PC to TV Converter, VGA to Composite Video or S-Video VGA to TV Converter. VGA to TV, HDTV, Plasma TV converter box for desktop PCs and notebooks in PC screen resolutions: 640x480, 800x600 and 1024x768Technical Details: Supported TV Standards: NTSC, PAL, PAL-M, PAL-N and SECAM. VGA input signal resolution includes 640x480/800x600/1024x640/1024x768/1280x720/1280x768/1280x800/1280x1024/1280x854/1280x960/1360x768/1365x768/1366x768/1440x900/1600x1200/1920x1080/1920x1200/1920x1440/1152x864/1176x664/1600x900/1600x1000/1600x1024/1680x1050/1768x992/1792x1344/1800x1440/1856x1392/2048x1152/2048x1280/2048x1536/2560x1600. 1 VGA signal input port, 1 AUDIO input port. Supported input VGA signal resolution: 640 x 480/ 800 x 600/ 1024 x 640/ 1024 x 768/ 1280 x 720/ 1280 x 768/ 1280 x 800/ 1280 x 1024/ 1280 x 854/ 1280 x 960/ 1360 x 768/ 1365 x 768/ 1366 x 768/ 1440 x 900/ 1600 x 1200/ 1920 x 1080/ 1920 x 1200/ 1920 x / 1152 x 864/ 1176 x 664/ 1600 x 900/ 1600 x 1000/ 1600 x 1024/ 1680 x 1050/ 1768 x 992/ 1792 x 1344/ 1800 x 1440/ 1856 x 1392/ 2048 x 1152/ 2048 x 1280/ 2048 x 1536/ 2560 x 1600. Supported input VGA signal resolution: 640 x 480/ 800 x 600/ 1024 x 640/ 1024 x 768/ 1280 x 720/ 1280 x 768/ 1280 x / 1280 x 1024/ 1280 x 854/ 1280 x 960/ 1360 x 768/ 1366 x 766/ 1440 x 900/ 1600 x 1200/ 1920 x 1080/ 1600/ 1600x/ 1920 x 1440/ 1152 x 864 x664/ 1176/ 1176 x 900/ 1600 x 1000/ 1600 x 1024/ 1680 x 1050/ 1768 x 992/ 1768 x 1344/ 1792/ 1792 x 1440 x 1392/ 1856/ 1856 x 1152 x 1280/ 2048/ 2048 x 1536/ 2560 x 1600. VGA Input Port: 1. VGA input signal resolution includes 640x480/800x600/1024x640/1024x768/1280x720/1280x768/1280x800/1280x1024/1280x854/1280x960/1360x768/1365x768/1366x768/1440x900/1600x1200/1920x1080/1920x1200/1920x1440/1152x864/1176x664/1600x900/1600x1000/1600x1024/1680x1050/1768x992/1792x1344/1800x1440/1856x1392/2048x1152/2048x1280/2048x1536/2560x1600. 1 VGA signal input ports, 1 AUDIO input ports. Enter the VGA signal to support resolution 1x Converter. Support for full screen (OVERSCAN) and non full screen (UNDERSCAN) two display modes. 1x Adapter. Function: Dispaly. Resolution: 1080P. Connector A: VGA. Application: Computer, TV, Monitor, etc. 1 x VGA Cable. 1 x USB Power Cable. Light, thin, short, small and easy to carry. Support full-screen (OVERSCAN) and non-full-screen (UNDERSCAN) two display modes. No need to install drivers. Portable and flexible. High quality scaling technology for input resolutions. Due to the difference between different monitors, the picture may not reflect the actual color of the item. Ideal cable to transmit the video signal from SCART device (such as a DVD/VHS, decoder) to a device equipped with VGA input (such as a monitor or a projector).